Artist's impression of a gas-giant exoplanet in close orbit around its star. Overthe past 200 years, a standard model has emerged to explain how solarsystemsform. Using our own solar system as a guide, the model explains theexistenceof a central star (our Sun), an inner system of rocky, "terrestrial"planets, and an outer system of "gas giant" planets, all orbiting innearly the same plane of rotation as the central star. Inthe generally accepted model for solar system formation, everythingbegins witha nebula (or cloud) containing gas and dust. Gravitational attractioncausesthe cloud to collapse, and if the collapse is less than perfectlysymmetric, angularmomentum will lead the cloud to form a nearly flat rotating disk. Thegreatest concentration of material collects at the center of the disk,forminga protostar, while protoplanets mayform at some distance fromthe center around areas of higher than average density within the disk.When theprotostar eventually collects enough matter, fusion reactions begin andit becomesa young star, heating the inner portion of the disk and vaporizing anygasesthat may have collected ? which naturally explains why planets thatform nearthe star are rocky. Atgreater distances, gases can remain in icy form and accrete into gasgiant planets. The limiting radius that defines the divisionbetween therocky inner planets and outer gas giants is called the "ice line". Whetherinside or outside the ice line, planets sweep out material within aparticularradius of the disk as they orbit the star, and over time bring togetherwhatever dust (and beyond the ice line, gas) are available at thatradius.Interaction between the planets and central star eventually put most oftheplanets in stable, near-circular orbits. Overthe past few years, as exoplanets have been discovered around otherstars, we'velearned that not every solar system follows our recipe. 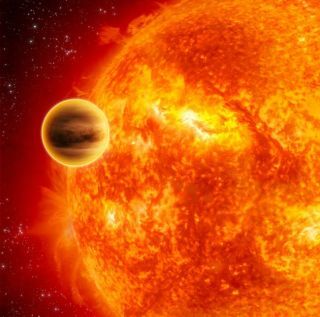 Among the firstexoplanetfindings were so-called "Hot Jupiter" gas giant planets in closeorbit around stars. Thenthere's the case of a gas giant planet orbiting a brown dwarf star in asystemthat hasn't been around long enough to provide time for the slowaccretion oficy particles predicted by the condensation model. In addition, a teamofastronomers at the Geneva Observatory recently announced that amajority of 27 "HotJupiter" exoplanets are not orbitingin the same plane of rotation of their host star, with sixactually inretrograde orbit (opposite the direction of rotation of the host star). Variousschemes have been suggested to explain how a gas giant could formbeyond theice line and then move inward toward the star to become a "hot Jupiter." Onemodel, called "migration", involves interaction between a gas giantand a ring of debris in the protoplanetary nebula. Tidal interactionbetweenthe gas giant, the primary star and the debris ring could cause the gasgiantto slowly spiral in, ultimately arriving in a circular orbit close totheprimary star. However,this model would still leave the gas giant orbiting in the plane of theprimarystar's rotation. It cannot explain the high inclination and retrogradeorbits observed by the Geneva team. Thereis, however, a model that can explain them: In a 2007 paper, Princetongraduatestudent Daniel Fabrycky, expanding on earlier work by others, showedhow theycould occur in a binary star system. In this scenario, the primary starisorbited by a distant companion star, and gravitational interactionbetween agas giant planet orbiting the primary star and the companion star coulddestabilize the gas giant's orbit. Thiswould turn the planet's circular orbit in the plane of the primarystar'srotation to an eccentric orbit much like that of a comet, tiltedsignificantlyto the plane of rotation. Over time, tidal interaction between the gasgiantand the primary star circularizes the gas giant's orbit at its closestdistanceto the primary star ? making it a hot Jupiter. WhenFabrycky used computer simulation to model variations on his theory, hefoundthat a significant proportion of the gas giants he modeled wound up inretrograde orbit, opposite the direction of rotation of the primarystar ? as wassubsequently observed by the Geneva group. Evenwithout a distant binary companion, the orbit of a gas giant could bedestabilized if a number of other giant planets in the same systemhappen tocome close together. A 2008 paper by Mikio Nagasawa of the TokyoInstitute ofTechnology found that interactions between gas giant planets couldproduce asignificant percentage of hot Jupiters, with "a broad range of orbitalinclinations (even retrograde ones)." AsFabrycky (who is now a fellow at the Harvard-Smithsonian Center forAstrophysics) says, "If you have a planet in a high-inclination,comet-likeorbit, the orbital elements couple. That gives you very little angularmomentum, and makes it easy to change the orbit into a retrogrademotion." Fabryckybelieves the discovery of hot Jupiter exoplanets in retrograde orbitsdoes notinvalidate the standard accretion model, but their existence does"raise anew point of view. In general, solar systems are chaotic andviolent,"which means that our own "relatively peaceful" solar system may besomething of an exception. RoryBarnes, a Postdoctoral Research Associate in Astronomy and Astrobiologyat theUniversity of Washington, agrees with Fabrycky on that point. "Thesimplequiescent model we think of with our solar system isn't ubiquitous.There are alot of things going on that we didn't anticipate." Barnesalso agrees that a companion star in a binary system could destabilizeplanetary orbits, but adds, "I have a hard time believing thatimprobableevents like this could lead to a large percentage of planets inretrogradeorbits." Whateverthe mechanism, any process that destabilizes the orbit of a gas giantenough tochange the plane of its orbit and move it close to the primary starwould spelldoom for any terrestrial planet in the same system. Interaction withthe gasgiant would probably destabilize the orbit of planets in the innersolar system,potentially tossing them out of the solar system entirely and making itunlikely that life as we know it would have time to develop. Thus,if planetary systems with renegade gas giants turn out to be common,life as weknow it may be very rare.